In 2017,[update] the Episcopal Church had 1,871,581 baptized members, of whom 1,712,563 were in the United States. 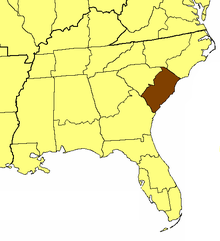 In 2011,[update] it was the nation's 14th largest denomination. In 2015,[update] Pew Research estimated that 1.2 percent of the adult population in the United States, or 3 million people, self-identify as mainline Episcopalians. From 1635 the vestries and the clergy came loosely under the diocesan authority of the Bishop of London. After 1702, the Society for the Propagation of the Gospel in Foreign Parts (SPG) began missionary activity throughout the colonies. On the eve of Revolution about 400 independent congregations were reported[by whom?] throughout the colonies. In 1789,[when?] 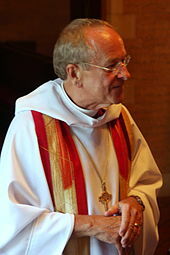 representative clergy from nine dioceses met in Philadelphia to ratify the church's initial constitution. The Episcopal Church was formally separated from the Church of England in 1789 so that clergy would not be required to accept the supremacy of the British monarch. A revised version of the Book of Common Prayer was written for the new church that same year. 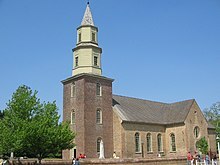 The fourth bishop of the Episcopal Church was James Madison, the first bishop of Virginia. 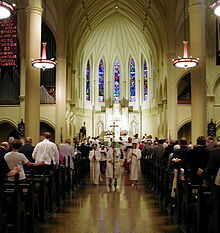 Madison was consecrated in 1790 by the Archbishop of Canterbury and two other Church of England bishops. This third American bishop consecrated within the English line of succession occurred because of continuing unease within the Church of England over Seabury's nonjuring Scottish orders. 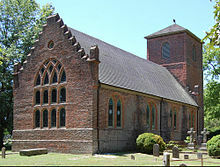 The Episcopal Church thus became the first Anglican Province outside the British Isles. As of 2014[update], the Episcopal Church reports 1,956,042 baptized members. The majority of members are in the United States, where the Church has 1,866,758 members, a decrease of 27,423 persons (-1.4 percent) from 2012. Outside of the U.S. the Church has 142,326 members, a decrease of 30,203 persons (-17.5 percent) from 2012. Total average Sunday attendance (ASA) for 2013 was 657,102 (623,691 in the U.S. and 33,411 outside the U.S.), a decrease of 3.4 percent from 2012. In the 1970s, a Fortune magazine study found one-in-five of the country's largest businesses and one-in-three of its largest banks was run by an Episcopalian. 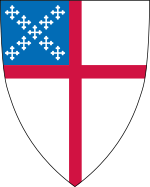 [needs update] Numbers of the most wealthy and affluent American families as the Vanderbilts, Astors, Whitneys, Morgans and Harrimans are Episcopalians. 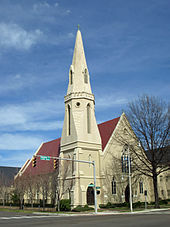 The Episcopal Church also has the highest number of graduate and post-graduate degrees per capita (56%) of any other Christian denomination in the United States, as well as the most high-income earners. According to a 2014 study by the Pew Research Center, Episcopalians ranked as the third wealthiest religious group in the United States, with 35% of Episcopalians living in households with incomes of at least $100,000. 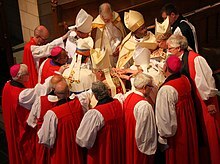 Wikimedia Commons has media related to Episcopal Church (United States).